I'm going to share a portion of my life with you all. This story will help you to understand just why I am so passionate about helping others and giving back. Several years ago my husband suffered two strokes simultaneously. We were both donating plasma the day that it happened. When the nurse pulled my husband's needle out he immediately felt funny. I remember him not being able to speak quite right and then he threw up. He complained that one side of his face felt numb and then the severe migraine hit. He had many other symptoms but those are the ones I remember the most. The nurses at the plasma donation center had no clue what was going on. I knew I had to get him to a hospital right away. He spent several days in the hospital and the doctors weren't sure if he would be left with permanent damage. After he was sent home he tried to go right back to work, he wanted to support his family. I believed him when he said everything was fine but the truth was he would not be able to work. He was still going through therapy for goodness sake! We found out a few days later that the restaurant he had been working at fired him even though they knew he was in the hospital. His insurance was cancelled and we were left with medical bills in the thousands that we are still paying off. He quit his second job and I went off immediately to look for work. Unfortunately I did not find much of anything and our finances suffered. We applied for unemployment but he was rejected simply because he tried to go back to work for one day. It was a big mess. We slowly ran out of money and soon realized we needed help. We applied for food stamps but that was a lengthy process and not an easy or quick fix. We had a terrible case worker who kept losing our paperwork over and over. Our cupboards and fridge were bare, our rent was past due and bills were piling up. We had a little one's mouth to feed too. There was a day when we had literally nothing to feed our family and so we grabbed whatever change we could find, put $1.48 in the gas tank and drove a block away to a food pantry. At the food pantry we were treated with such respect and kindness. The wonderful people there sat us down and asked us about our needs. They made a list and then asked us to pick out some produce while they packed the rest. When we walked out of there we had enough food for a whole week plus a few diapers and toiletries that we so desperately needed. I specifically remember being given some Dove shampoo and conditioner. It was so comforting to be able to use the brand that I loved, it made me feel like things could have some sort of normalcy again. We ended up using the pantry a few more times until our food stamps were straightened out. I'll never forget the help that we were given. The only reason we were given help was because others donated. Ever since our experience our family has helped to give back whenever and however we could. I'm always looking for more ways to give back, it has become a passion of mine. One way that we have found is the Cross Off Hunger initiative with Unilever's family of brands. Unilever is committed to donating more than two million meals to families in need with Feeding America and every item on your shopping list counts. Show your support by adding Unilever brands to your cart next time you shop. Together we can help to Cross Off Hunger. You can learn more and help by visiting MakingLifeBetter.com or by using your favorite Unilever products. My family is committed to helping to make an impact. We plan to keep using the Unilever products that we love and maybe trying a couple that we have not used in our home yet. 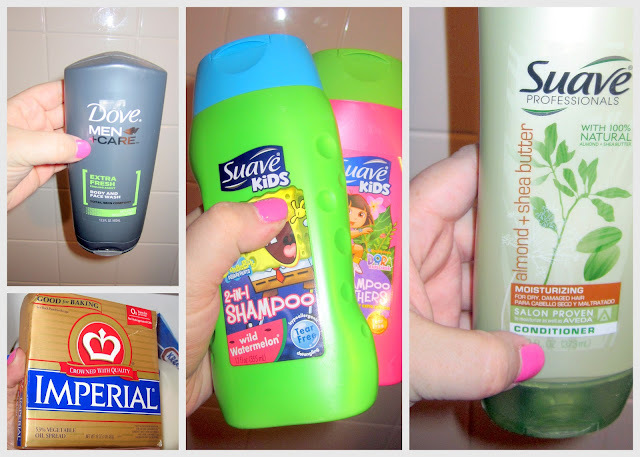 I walked through my home and found just a few products that we already use from Unilever. All of these products are items we have continually purchased because we enjoy the quality and fair price. I will be making a shopping trip in the next couple of weeks. In that trip I am going to see how many Unilever products I can buy from our list of needs. Simply by buying things that we already need I can help Unilever reach their goal, it's as simple as that. Who knew that such a simple action could have such a great impact in helping to Cross off Hunger in America.